GoDaddy GoCentral is a revolutionary website builder tool made for complete beginners, an all-in-one website building tool that integrates email marketing, search engine optimization, mobile-first design, social media profiles and lots more. Want to start a website or online store, but have absolutely no idea how to? Good Great news. GoDaddy just launched their new website building tool called GoCentral. GoDaddy GoCentral is unlike any other website builder tool out there! GoCentral isn’t just another average do-it-yourself site-building tool. Nope this is a true “website builder”. This means no html coding needed and no outdated or boring looking designs. GoDaddy’s GoCentral will help you create a mobile friendly and search engine optimized website or online store in no time! It’s 100% designed for Google, mobile, social and SUCCESS. Find out more by reading our GoDaddy GoCentral review. You will learn what GoDaddy’s GoCentral website builder is, and what makes it different to all the others out there. How GoDaddy’s website builder works, its main features and what pricing plans are available. GoCentral is a website building tool that lets you create a website regardless if it’s for your personal or business needs, and regardless of your skill set and how much you know about creating websites. You no longer have to choose between a website or an online store – you can now have both! Whether you want a blog, an online store, or a professional small business website to attract new customers, you get to choose how simple or dynamic you want your site to be. Just pick a design and go create your website with GoDaddy’s GoCentral website builder. How does GoDaddy GoCentral work? 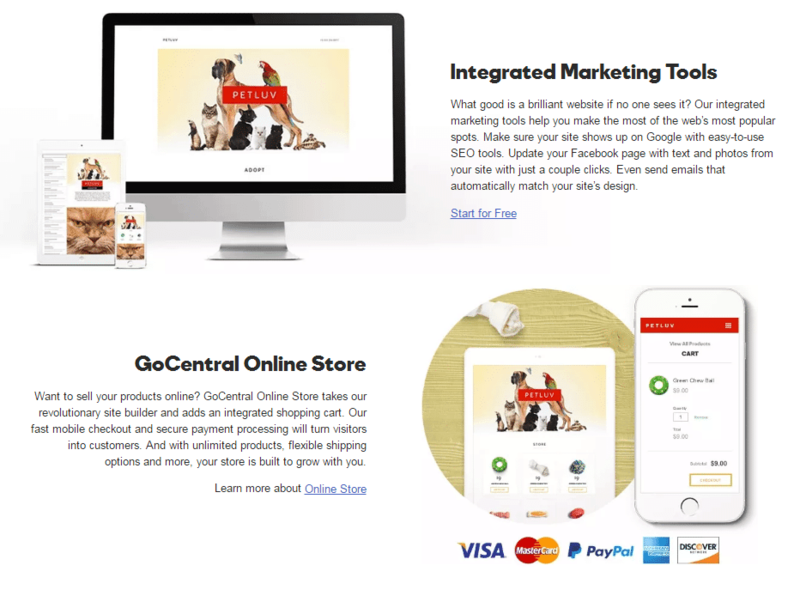 What’s really awesome is that GoDaddy GoCentral comes integrated with online marketing and ecommerce tools. Meaning GoCentral also helps with growing your business – not just with building it! So you don’t have to worry about things like search engine optimization, social media, email marketing, shopping carts, secure checkout, ssl certificates and payment processing. This revolutionary new site builder tool lets you create your website or online store in less than an hour. You get to choose from hundreds of free and modern designs that look great on both desktop and mobile devices. Type in your sitename, idea or industry (like plumber, hairstylist, landscaping etc) and GoCentral will automagically create a near-complete website, pre-filled with relevant website sections and professional images for you. There are more than 1,500 ideas and industries supported. From there on you simply customize your site further, using the built-in and foolproof design tools, and the connect the built-in online marketing services so that your site attracts visitors on Google, Facebook and via email. If you’re creating an online store then GoCentral comes integrated with a shopping cart, fast mobile checkout and secure payment processing. GoDaddy, the father of all domain registrars and web hosting companies recently launched a brand-new website builder. They created from the ground up to be easy to use and functionally flawless. Reports are that you can build a fully responsive website —from your smartphone even, in under an hour. Not only does it include a full set of marketing tools and resources, but it also allows users the ability to create an audience to support your business — instead of the other way around. The new product offers highly responsive templates for more than 1500 industries. The main difference from traditional website builders is that they allow the customer to focus on their business goals and create a website that precisely supports those goals. Getty Images, America’s preeminent stock photo agency has partnered with GoDaddy to offer tens of thousands of the most breathtaking high definition images, guaranteed to bring your website to life. The images are licensed for use exclusively with the GoCentral product and can be edited somewhat to fit your needs or brand aesthetic. If you thought you couldn’t get better than “drag and drop;” now there is “swipe to style” technology. The functionality of the app utilizes the very same mobile-first technology that will drive your site’s bells and whistles. Say goodbye to cookie cutter templates that force your business or personal website into submission. With GoCentral, your style and needs dominate the flow and appearance of every page. Create an entire website of landing pages, if that is what best suits your customer’s needs. From the color schemes to the web elements, each detail is the handiwork of a professional designer who has painstakingly thought everything through. Even the mix and match graphics coordinate with each other and the other elements to create a website that has a truly custom appearance and artisan feel. Use the pre-selected and curated elements with recommended color schemes to create a website that is certain to delight or use custom color options to bring your brand alive in your unique way. With most minor-league website builders, mobile responsiveness and functionality are an afterthought. This is the first website builder that delivers on the “mobile first” mindset that is so integral to marketing efforts and business success. The site states that it is possible to build an entire website from registration through launch right from your smartphone or tablet. While that may not be your first choice for deployment, it is certainly a remarkable claim. Once your site is designed, the real work can begin. The app’s “smart learning system” is intended to drive traffic through engagement. Collecting, analyzing, and reporting massive amounts of data from your website’s users the GoCentral built site activity updates and recommends key ways in which you can improve your results and reach your business goals faster. GoDaddy drives business results through marketing features that populate the GoCentral app, collecting data and driving relevant traffic to your sites. These functions include email campaigns, loads of SEO resources, and even the ability to create and launch a Facebook account directly from the dashboard. Social Media – The site builder, can automatically create a Facebook page for your business, or, if you have one already, it will help you manage it. SEO and SEM – GoCentral automatically reviews and optimizes your sites for Google and other search engines. This results in increased quality traffic to the site and an increased number of inbound marketing leads. Email Marketing – GoCentral uses the branding of your site to create “eye-popping” email campaign. But that’s not all; they also include the powerful analytics you need to track its success. ecommerce – want to set up shop? GoDaddy will offer their own stand-alone marketplace called the GoCentral Store that is fully-integrated into the design of each site. In addition to fast checkout, they also handle all payment processing with fully secured high-level SSL technology. How much does GoDaddy GoCentral cost? There are four plans available. All have a 30-Day free trial with no credit card needed to start. While it is new to the market and therefore, somewhat untested, the features and hype are very exciting. The websites that have been built, within a matter of minutes, using the site builder are impressive. The look professional enough to have cost thousands of dollars and taken weeks or months to build. The partnership with Getty Images is to thank for the high-end look. Mobile-first technology is cutting edge and future proof to the degree that anything can be these days. One thing is for certain, mobile functionality and screen flow will not be something you must reverse engineer. Any site built using GoCentral is sure to be touchscreen friendly and feature a fully responsive design. Anyone, including YOU, can make a website with GoCentral. Build your website or online store now – no technical skills required! You are here: Home > Welcome To The Digital.com Blog > Tips > GoDaddy Sitebuilder Review: Can You Actually Build a Website With It? We Find Out.